Music streaming hits a record high in the UK | What Hi-Fi? The number of songs streamed in a week broke through the 500 million barrier for the first time in the week to 16th July 2015. According to the latest figures from the Official Charts Company, the launch of Apple Music - combined with the likes of Spotify, Deezer and Tidal - has resulted in a record 505,849,000 streams for the week ending 16th July 2015. That's almost double the amount for the same period in 2014, when streaming averaged 275 million songs per week - a total of 14.8 billion a year. The total number of tracks streamed is up 80 per cent in the first half of 2015 to 11.5 billion. If that rate of growth continues, the Official Chart Company reckons the total number of audio streams will top 25 billion by the end of 2015. Geoff Taylor, chief executive of the BPI and BRIT Awards, says: "It is remarkable that we now speak of billions of audio streams a month - it demonstrates vividly just how quickly music streaming is being embraced by British music fans." Mark Ronson and Bruno Mars's Uptown Funk is the UK's most streamed song of the year so far, played more than 45 million times. 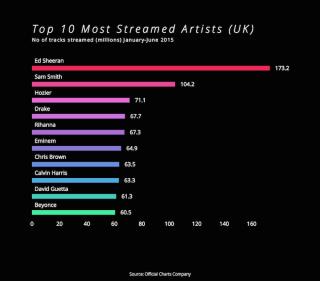 And Ed Sheeran is currently the most streamed artist, with his tracks streamed more than 170 million times this year.